The Mallee Ringneck has a deep indigo blue black, emerald green crown, red frontal band, green-blue slate nape, emerald green rump with abdominal band varying from yellow to orange and from large to almost absent and is 35cm average. Females are slightly shorter. They can be found from the Murray Mallee areas of South Australia, Victoria, and NSW. Then as far north as Windorah and Barcaldine in Queensland and as Far East as the Moree district of NSW. 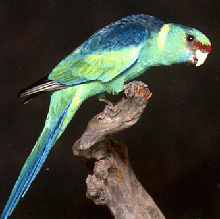 There are many subspecies of the Mallee Ringneck. Diet consists of seed, fruit, berries, nuts of native and introduced grasses, weeds, shrubs, tree blossom, vegetable matter, pollen, nectar, insects and wild paddy melons. As they are ground feeders and require worming at least twice a year. The breeding season occurs from August to November although at times it has been recorded as early as July and late as December. Usually they lay 4 or 5 sometimes 6, white rounded oval eggs. The incubation period is 19 days. The young fledge at approximately 5 weeks. It takes 2 years for them to fully colour. The compatibility of pairs is very important and they should be housed one pair to an aviary, they will fight with their neighbours so the aviaries should be double wired also they should not be housed in colony situations of mixes sexes. Preferred nest is a vertically hung hollow log with natural entrance spout. Sexes are similar with the female being a duller version of the brightly coloured male; the male has a large head with a prominent brow, flat crown and a large beak. The female has s small head, with rounded crown and small beak, the juveniles are similar to the adult female only much duller with muted colours and a yellowish to pinkish, horn coloured beak. Sexual differences similar to adults and usually visible in juveniles the underwing stripe is absent in adult males, visible in adult females and is usually present in juveniles. It is an unreliable guide to sexing.